Spanish moss does not need fertilizer but it can be sprayed with a compost tea such as Organic Plant Magic. Spanish moss grows on trees in areas of high humidity. It can be found on live oak and pines that border estuaries, rivers, swamps, and along the coastal plains of the Southeastern United States. Spanish moss may be propagated by seed or by division. The plants are very easy to grow, as they need no soil or transplanting, requiring only warmth and moisture. They are grown in greenhouses or outside in warm climates. The plants need temperature of 70 degrees or warmer in the summer and not less than 60 degrees in the winter. The plants grow well in full sunlight to partial shade. To propagate by division, place divided plantlets on bark slabs in areas with plenty of light and moisture. A weekly misting is sufficient to meet the nutritional needs with an occasional addition of diluted fish emulsion. Spanish moss rarely blooms in cultivation. In nature, most new Spanish moss plants sprout from a seed. 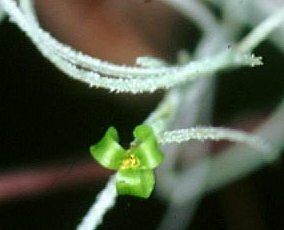 The tiny, green flowers produce a brown seed pod that splits open at maturity. The seeds inside are equipped with feathery parachutes that enables them to float like dandelion seeds to branches, tree trunks or other objects where they grow. Birds and wind carrying strands of spanish moss to new locations where they grow into new plants. Although Spanish moss does not take nutrients from the host tree, it should be thinned if it becomes too thick. This is because it may either shade the tree's leaves or, when it is wet it can become very heavy and the branches may break under its weight. Ideal Habitat: High Humidity. Close to bodies of water. Ideal Temperature: Summer: 70 degrees or warmer. Winter: 60 degrees. Minimum 22 degrees. Orientation: Hanging so that most of the plant is free floating. Watering: Mist plants weekly with lukewarm water with an occasional addition of diluted fish emulsion. Blooms: Spanish moss rarely blooms in cultivation.